Michelle Outram, Not the sound bite, 2006. Courtesy the artist and Terminus Projects. Should artists be seen and not heard? 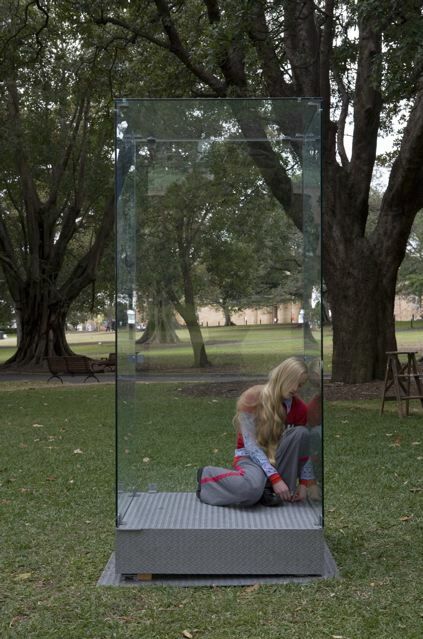 Or should they be put in a glass booth for our inspection? This latter option is now possible thanks to Michelle Outram’s Not The Sound Bite a performance installation piece which is part of Terminus 2006. Each Saturday and Sunday between 11am and 3pm in June [and that means there’s only one weekend left, hurry] Outram gets into the glass booth for an a long performance piece accompanied by a soundtrack of antique political speeches over by a spooky electronic soundscape of distant bells and low tones. Outram makes like Robert Shaw, gesticulating in slow motion, wiping her face against the glass, getting up on a little ladder and making mock heroic poses. The piece takes place at Speakers Corner, which is not really a corner, but a zone designated as a place where free speech can be exercised in the form of public oratory. As recently as the late 80s, Speakers Corner was a thriving side show of religious nuts, right to lifers, women’s rights activists and anyone else with an axe to grind and a step ladder [or upturned garbage bin]. It’s now a rare sight to catch anyone exercising their democratic rights and Outram’s Not The Sound Bite feels remarkably like elegy for the death of free public speech. In the weekdays when the artist is elsewhere, the glass booth stands empty, waiting for something to happen as the speeches drone on and one and you begin to understand why politics is now a soundbite – it’s pretty much all you need to know. Jay Ryves, Sky Village, 2006. Terminus Projects have installations all over the city, some real, some virtual. 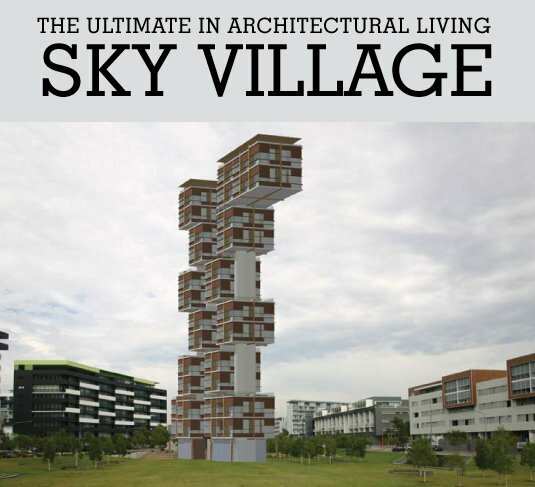 Jay Ryves’s Sky Village is almost entirely virtual except for a mass mail out to residents in Waterloo and Redfern advertising a fabulous new apartment development smack bang in the middle of Meritontown. This stunning development offers apartments ranging from studio to four bedroom, all with parking, close to amenities, shops and the thriving shopping precincts of Surry Hills. Prices start at around $500k with finance available to approved clients. We have been looking for a new city location for The Art Life offices and we’re thinking of moving into these fantasy villas. The problem is – are they real? They certainly feel as thought they are. Much of the work in Terminus 2006 plays on the fantastical possibilities of their locations, attempting and mostly succeeding in evoking the strange, the uncanny and the positively depressing. 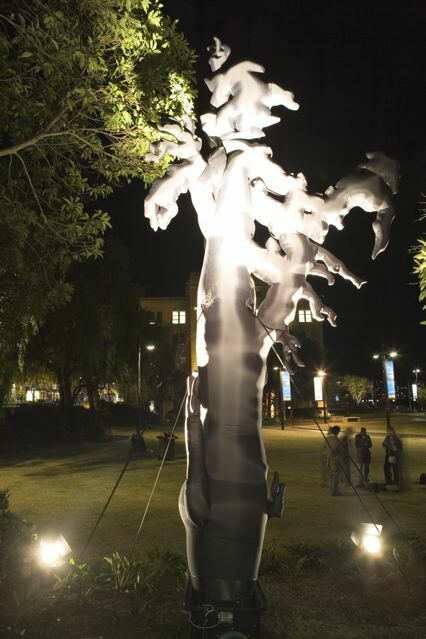 Caroline Rothwell’s sculpture Hybrid takes its form from a botanical illustration of Sydney Cove from 1793 by Thomas Watling, an artist of early Colonial Sydney. Located in First Fleet Park next to the Cahill Expressway and stumbling distance from the MCA, Rothwell has taken Watling’s image and turned it into a towering inflatable that looks remarkably like a piece of ginger, or maybe a triffid as it hides from the world among real plants and trees. In the day time the work looks forlorn, but at night it takes on a menacing aspect with dramatic lighting and its slowly undulating surface. David Haines, Reverse Time Gate, 2006. Documentation of press preview by TEAM Art Life. At Devonshire Street tunnel at the Devonshire Street end, David Haines has installed an audio piece called Reverse Time Gate. Those familiar with Haines’s work, from his sound and audio performances to his collaborative videos and photographic images, knows that he has a knack for creating incredibly eerie works that create an uncomfortable sense of dread. Reverse Time Gate is no exception. Using concealed microphones, a computer records 15 seconds of audio and then, through speakers, plays the recording backwards. Mixing the recorded sound with the live acoustics of the space, Haines has taken the invisible audio world of the space and amplified it into the consciousness of the hapless passerby. We don’t know how most people react, but for us it was deeply unnerving, akin to a the Cthulhu breaking through the floor. James Lynch, The Party’s Over, 2006. There’s an article about James Lynch in the latest Art & Australia which helpfully explains that is work is ambiguous, dream-like and defies easy explanation. So that’s our work done… Lynch’s participation in Terminus 2006 is by way of a video called The Party’s Over which screens between 4pm and midnight in the food court of World Square, which, at that time, is mostly deserted except for people walking between shops. On a screen The Party’s Over loops around and around, a sequence lifted from the film The Party treated to look like an animated sequence a la Lynch’s other videos, or if you haven’t seen them, like Richard Linklater’s Waking Life. 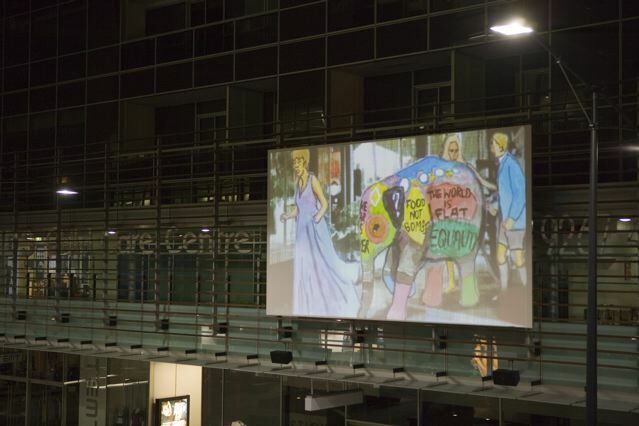 The sequence is from the Peter Sellers ‘romp’ and features a sad elephant hijacked by beautiful people, covered in slogans including THE WAR IS OVER. In the context of the context [as it were] the video evokes in inescapable sense of sadness, neither dreamlike nor ambiguous particularly, but filled [or drained] with such ennui it’s hard to look upon it. Terminus Projects is the baby of Sarah Rawlings and Clare Lewis and falls under the precarious title of an “independent curatorial initiative” which can often translate as some nice art in a nice location – usually a university gallery. Happily, Terminus Projects is a major success for a project that was put together on a shoestring budget and the will to make it happen, and even more impressive that the majority of the works really come off. The parlous state of public sculpture in Sydney is one thing, but the complete non existence of contemporary art outside of corporate atriums is nothing short of pathetic. Terminus goes a long way to rectifying this situation and we wish them well in their ambitious plans for 2007.